Through Proto Central Eastern Polynesian *Māfoe "A tree with paddle-shaped leaves"
The name Māhoe is also used in conjunction with related species of Melicytus; one of these, M. lanceolatus, is mentioned on this page, and there is a link in the "further information" section to the NZ Plant Conservation Network's descriptions of these trees . 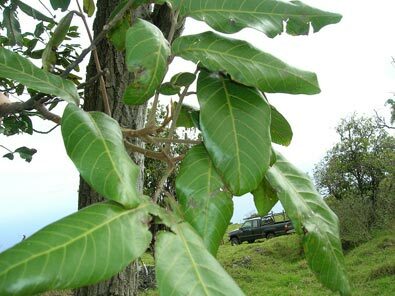 It is not certain that Māhoe is a directly inherited name, as the only other māhoe is in Hawaii -- a tree quite closely related to the New Zealand tītoki, Alectryon excelsus (Sapindaceae). However the Hawaiian tree does have some things in common with the māhoe of Aotearoa -- similar height and general habit of growth, berries (or fruit-like appendages to the seeds in the case of the Hawaiian tree -- the group to which the titoki belongs don't have real berries) which birds like, and separate male and female flowers. There is a "missing link" though, as there is no "māhoe" in the Tahiti area (Tahiti, Tuamotu, Rarotonga or the Marquesas); however that is not a fatal flaw, as names carried to the geographical extremes of a language area would be the ones that were important to the emigrants at the time they departed, but not necessarily of special importance to those who stayed behind. So the name could well be replaced at the point of origin and remain known in outlying areas. The East Coast name for the New Zealand māhoe, hinahina, is also a plant name in Hawaii but not in Tahiti and neighborhood. The possible origins of that name are discussed on the page for the hypothetical Proto Eastern Polynesian word *sinasina. Nā wai te puia hinahina i kī hei tū i tūātea moana; tēna rā te wao tōtara māna e tū tūātea moana. "Who would go to sea in a vessel made of māhoe? -- tōtara is the wood of choice." Māko anō e hanga i tōku nei whare. ko nga poupou he māhoe, patete. Me whakatupu ko te hua o te rengarenga, me whakapakari ki te hua o te kawariki. "I shall fashion my own house. The ridge pole shall be of hīnau. The support posts of māhoe and patete. Those who inhabit the house shall be raised on rengarenga and nourished on kawariki." The hīnau (Eleocarpus dentatus) is a tree which produces a highly esteemed fruit but whose heartwood is very prone to decay, often leaving a hollow trunk, and thus is not normally the wood you would select for the ridgepole of the house; māhoe similarly is a timber easily waterlogged and not at all suitable for building, while the wood of the patete, Schleffera digitata, also lacks durability. 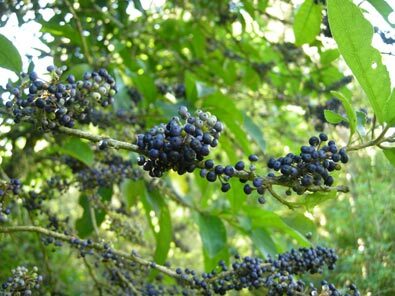 The roots of the rengarenga lily (Arthropodium cirratum) and the berries of the kawariki shrub (Coprosma grandifolia) were useful and nutritious famine foods, but hardly preferred options for everyday fare. Potatau thus affirmed that despite the catastrophe that had overtaken him and his people, they would make use of the little that they had left to renew their strength and thrive once more. Furthermore, Elsdon Best's disparaging remark notwithstanding, the māhoe (Aotearoa version) is not in the least a useless tree. 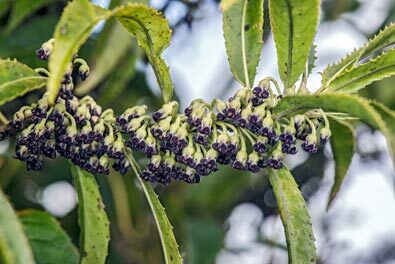 The juice from the berries was a key ingredient in tatooing ink, and it is one of the Māori fire trees: a great wood (when dry) for starting a fire either with matches or friction. The bark was used for treating burns, and it is one of the trees (along with mānuka, kānuka, and makomako) that adds phosphates to the soil in the early stages of regenerating cleared land. It was very common in the Waikato before much of the land was denuded of trees to make way for dairy farms (probably because it likes damp environments like riverbanks, but it also does well in limestone country). The deeply coloured berries have also made it a colour term: it represents indigo in Sidney Melbourne's well-known rainbow song. The flowers, which energe directly from the branches, are very small -- about 3 mm in diameter. 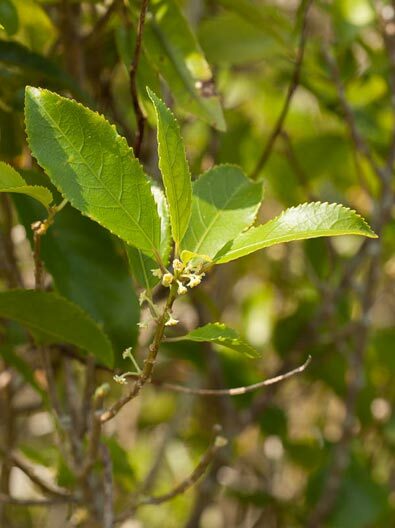 The female flowers are an inconspicuous pale green, but the male flowers are a creamy yellow and sweetly scented. 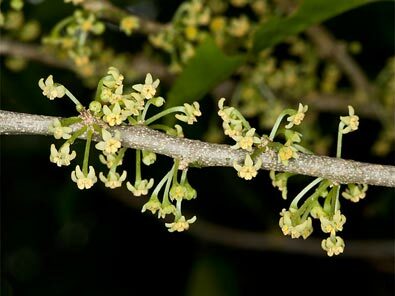 A related species, the māhoe wao, has much narrower leaves than M. ramiflorus, with larger flowers (about 5mm in diameter, twice the average for M. ramiflorus), and somewhat duller dark-purple fruit. The female flowers are yellowish and the male ones purple. 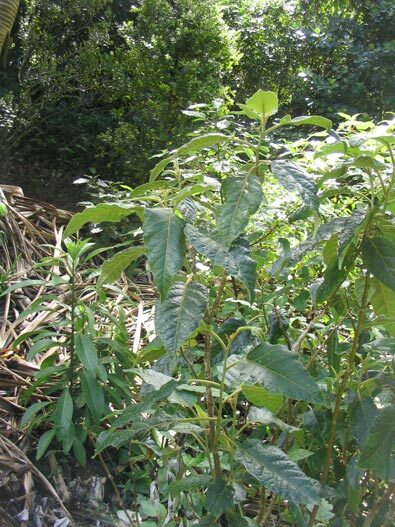 The māhoe wao starts flowering in the winter, and continues fruiting late into the summer. It is a much smaller tree than the māhoe proper, growing to about 5 metres high; it likes cooler places, and is found throughout Aotearoa at higher altitudes and in damp, frosty locations. The name māhoe may be of Proto Central Eastern Polynesian origin, but, as noted above, the evidence for that is a little shaky. In a discussion we had about the origin of the name, Brad Haami suggested that it might have been prompted by the shape of the leaves, which are reminiscent of the traditional paddles (hoe) for a canoe. This is highly plausible, and it is possible that the name was coined by combining the prefix mā- to the word root hoe to describe a leaf shape, which was then applied to a tree, either before Hawai'i and Aotearoa were colonized by the first Polynesian explorers, or independently, using the same linguistic raw materials, after they had arrived in their respective destinations. The word had to be created somehow, and, given the shape of the leaves of the trees referred to, and the use of paddles in everyday life in Hawaii and Aotearoa, as well as Tahiti (where the word is absent, but would have been present if there happened to be a direct link between the Hawaiian and Māori words), using a combination of mā- and hoe certainly makes sense. 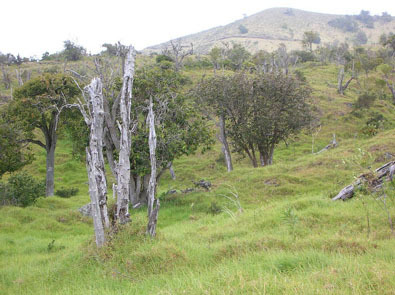 Both the Hawaiian and New Zealand māhoe are attacked by insect pests. 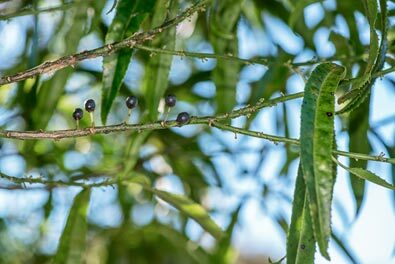 In Aotearoa the culprit is the māhoe moth, Feredayia graminosa, whose caterpillars can make a real mess of the leaves in Spring and early Summer, but fortunately they desist in time for the plant to recover. The Hawaiian māhoe, however, is not so fortunate. It is threatended with extinction by a combination of rodents, which eat the seeds and this have a severe impact on regeneration, and an exotic beetle, the tiny blacktwig borer, Xylosandrus compactus. This beetle is only about 2mm long, and was first found in Hawaii in 1931, on elderberry imported from Singapore. It bores into the host tree and raises is young in galleries, rather like the puriri moth in Aotearoa. 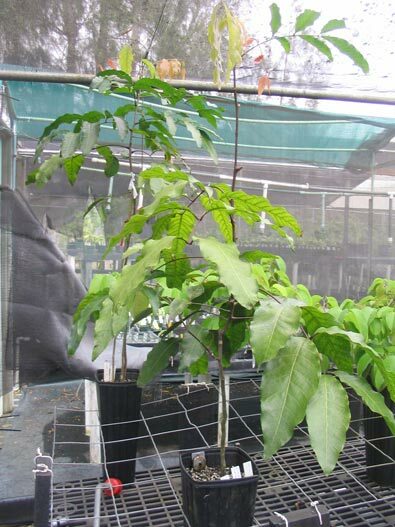 After a severe infestation the host tree may die, and between the rats and the beetles the Hawaiian māhoe in particular has been reduced to a few remnant populations. Efforts are being made to replenish the stock by raising seedlings in endangered plant nurseries (I was able to photograph some plants in one of these near the Kahanahāiki forest on Oahu -- see the gallery below). Alectryon macrococcus, the Hawaiian māhoe, has two varieties, A. macrococcus macrococcus, which has hairless or almost hairless leaves when mature, and is now rare but found occasionally in mountainous parts of Oahu, Kauai, Molokai and Maui, and one which has leaves with a persistent, rust-coloured tomentum, A. macrococcus auwahiensis, confined to higher altitudes in parts of East Maui. It has a hard wood, but it was not used traditionally in Hawaii, possibly because the tree, although widely distributed, was not common even before the blacktwig borer struck. However the fleshy arils (equivalent to berries) and the seeds were eaten. The small flowers are borne in long bracts, in contrast to the Aotearoan namesake, whose flowers emerge directly from the branches. 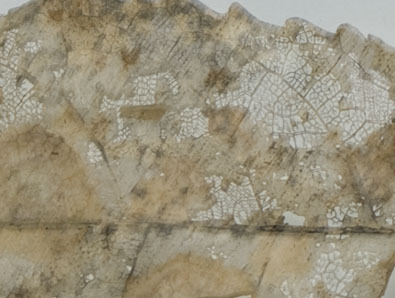 A notable feature of the New Zealand māhoe is the way its fallen leaves often retain the network of veins long after the rest of the leaf has decayed. 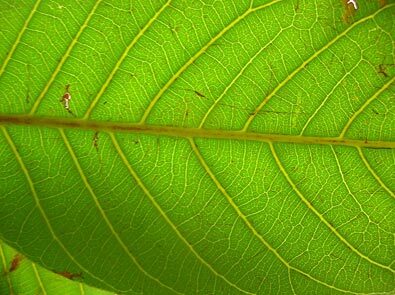 There is a beautiful photograph by Jeremy Rolfe of one such leaf on the forest floor, on the NZPCN network page and reproduced on the page for *Sinasina, and another in Dawson & Lucas NZ's Native Trees (p. 333). See also the gallery below. References and further reading: See linked pages, also Wagner et al., Manual of the Flowering Plants of Hawaii, along with general works on NZ trees, and those mentioned above (publication details listed in the bibliography). There is information about the blacktwig beetle on the Environment	Hawaii web page. The NZPCN web site has more information about the New Zealand māhoe and its relatives. Photographs: We are very grateful to the members of the NZ Plant Conservation network who have given us permission to use their photographs, on this page: Mike Thorsen, Jeremy Rolfe, and John Sawyer. Also to Kim and Forest Starr (Starr Environmental, Maui, Hawai'i). Unattributed photographs are by R.B. (Te Māra Reo). Alectryon macrococcum auwahiensis - Māhoe (Hawai') Note dead trees!